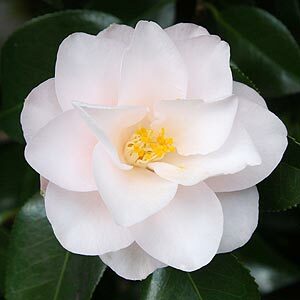 One of the more delicate yet stunning camellias is Camellia magnoliaeflora. Very soft pink flowers, and gently curling petals make it a most attractive plant in a part shaded position. This really is a camellia that needs a protected position in the garden to enable it to show off its best qualities. It is early to flower, which is desirable. However this can expose the flowers to the worst of the weather. Reaching around 2 – 3 m in height however slow growing, this is a camellia that could easily be grown in a container. Our Camellia japonica magnoliaeflora grows happily under the eaves of the house, it is protected from the worst of the rain when in flower. As you can imagine this is a slightly dark position, so those almost luminous flowers seem to glow in the evening light. Flowers are semi double light pink and contrast well against the dark foliage. Fertilize with slightly acidic fertilizer. Prune lightly as this is a slow growing plant.